We’d love your help. Let us know what’s wrong with this preview of The History of Anonymity by Jennifer Chang. To ask other readers questions about The History of Anonymity, please sign up. An intimate voice, one who whispers in the ear instead of shouting from rooftops, these poems use space, silence, and fresh language in ways that distinguish them from many contemporary poems. And to find a collection of such work is even more unusual. If there is a fault to this first book, it links into one of the book’s strengths, and that is the lyrical “I” that dominates the work and speaks directly to the reader—an “I” to “I.” Because of the dominance of this “I,” it relies on the reader’s An intimate voice, one who whispers in the ear instead of shouting from rooftops, these poems use space, silence, and fresh language in ways that distinguish them from many contemporary poems. And to find a collection of such work is even more unusual. Another one of those reads where one great poem alone could've made me give this book 5 stars, but this book doesn't stop at just one for sure. Chang's poems have a musicality that carry them so far to make you believe you are reading musical notes, not words. Her mastery employ of distinctive words are apt for the moment, never feels forced, but still surprise and delight. Her poems suggest those great qualities of trance and spontaneity, a free voice unburdened by rules, yet one can't help but Another one of those reads where one great poem alone could've made me give this book 5 stars, but this book doesn't stop at just one for sure. Chang's poems have a musicality that carry them so far to make you believe you are reading musical notes, not words. Her mastery employ of distinctive words are apt for the moment, never feels forced, but still surprise and delight. Her poems suggest those great qualities of trance and spontaneity, a free voice unburdened by rules, yet one can't help but admire and be jealous of the craft and form that subtly give heft at the same time. "No one sees how night fades you. born blind, lights years gone. you slowly come to, a shadow gift…"
i love this book. i liked the second half, unction, more than the first -- her language and abstraction are very pretty, but there's no comparison to the genuine emotion in "unction". beautiful, beautiful poetry. Biased reviewer: my book's in this series. Doesn't stop me from liking it. You will feel like a body and a mind tumbled smooth as seaglass when you read the title track, identities sloughing off, cares of being wearing down. Chang knows what she's doing. Take the ride. Wow! Chang has created a mythic space filled with puddles and mothers and oceans and stilts? maybe even stilts. This book pushes on and on through the subject of family dynamic and personal identity. It is assuredly not a bulbed tulip that will not bloom. It is erupted! looking forward to re-reading and re-re-reading. to consider: Sister, Mother, and their relationships with water and reflection - rejecting, searching for, and succumbing to each. Jennifer Chang is the author of The History of Anonymity. Her poems have appeared in Boston Review, Kenyon Review, New England Review, The New Republic, Virginia Quarterly Review, and elsewhere. She has received fellowships and scholarships from the Bread Load Writers' Conference, Sewanee Writers' Conference, The MacDowell Colony, and Yaddo. 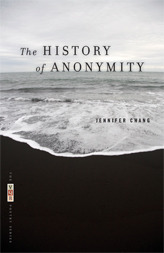 http://bookcritics.org/blog/arch Jennifer Chang is the author of The History of Anonymity. Her poems have appeared in Boston Review, Kenyon Review, New England Review, The New Republic, Virginia Quarterly Review, and elsewhere. She has received fellowships and scholarships from the Bread Load Writers' Conference, Sewanee Writers' Conference, The MacDowell Colony, and Yaddo.